When one of our patients at Providence Dental in North Las Vegas get an abscessed tooth, it’s time to make a choice: attempt to save the tooth with a root canal, or pull it. An abscessed tooth means the soft pulp inside it has become infected, and is dying. They usually hurt quite a bit. Performing a root canal can be straight-forward. It involves drilling into the tooth, removing the infected pulp, cleaning and disinfecting the root canal area, and then filling and sealing it. Root canals have a very high success rate. But there is always a chance of complications down the road. That’s why some patients decide to have the tooth extracted, and replaced with a dental implant. Like root canals, dental implants have a high success rate. With an implant, a post is inserted in the jaw where the root used to be, and the replacement crown is fitted over that. If you have been told that a root canal or a dental implant is needed, feel free to talk with us at Providence Dental about the pros and cons of each procedure. 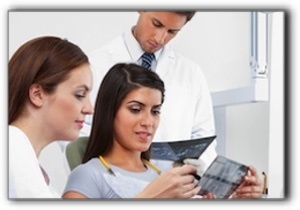 We’ll be sure to help you make an informed decision about your dental treatment. Our services also include family dentistry.